Paul Weller has just finished a run of American and Canadian tour dates. He kicked things off at Riot Fest and Carnival in Toronto, before playing intimate venues across the United States. If you weren't lucky enough to attend, you can still click here to see his performance of 'Heatwave' in Detroit. 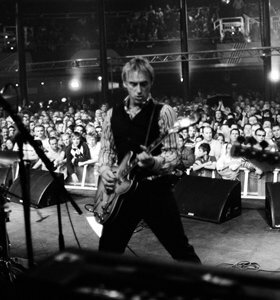 Weller also played Minneapolis, Cincinnati, Ohio and Chicago to great reviews. Before the Minneapolis show, Paul Weller spoke to Gimme Noise about his new release, More Modern Classics. The same can be said for Weller's upcoming limited edition, INTO TOMORROW, which chronicles his entire solo career in photographs. Fill in the below form to register your interest and be the first to receive updates. Above: Paul Weller in New York, 2007 © Lawrence Watson, taken from INTO TOMORROW.